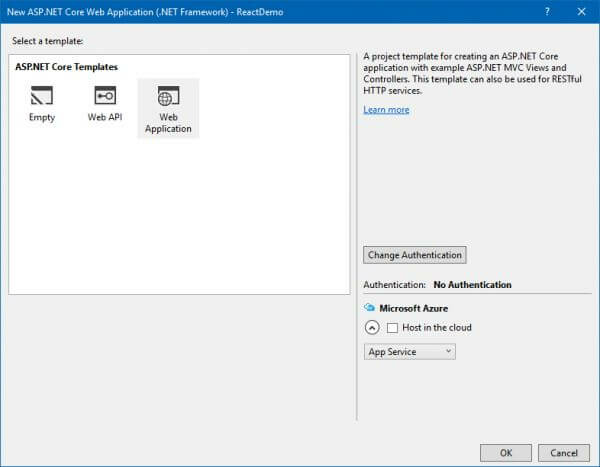 This tutorial covers the end-to-end process of creating a brand new ASP.NET MVC website and adding a React component in it. We will start from scratch and end with a fully functioning component. It assumes you have basic knowledge of ASP.NET MVC and using Visual Studio. This tutorial is based off the original React tutorial but has been modified specifically for ReactJS.NET. Live updates: other users' comments are popped into the comment view in real time. For this tutorial we'll be using Visual Studio 2015. If you do not already have a copy of Visual Studio, the Community version is free. We will be using ASP.NET Core MVC. 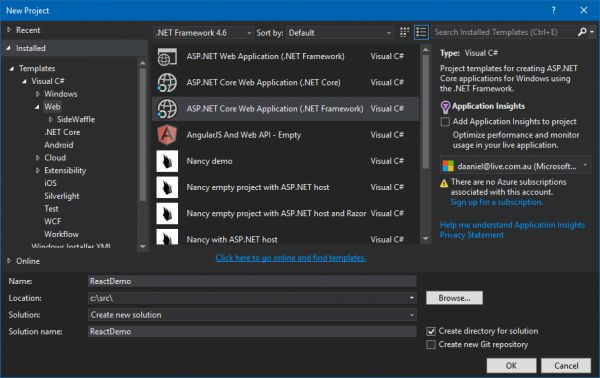 Go to Templates → Visual C# → Web and select the "ASP.NET Core Web Application (.NET Framework)" template. Call it "ReactDemo"
In the "New ASP.NET Core Web Application" dialog, select the Web Application template. Also, click "Change Authentication" and select "No Authentication"
Note: We are using .NET Framework in this tutorial, but you can instead use .NET Core if you want to be able to run your site on Linux or Mac OS. Currently .NET Core is missing some of the functionality provided by .NET Framework, so it is recommended to use .NET Framework unless you have a reason to use .NET Core specifically (eg. cross-platform support). We need to install ReactJS.NET to the newly-created project. This is accomplished using NuGet, a package manager for .NET. 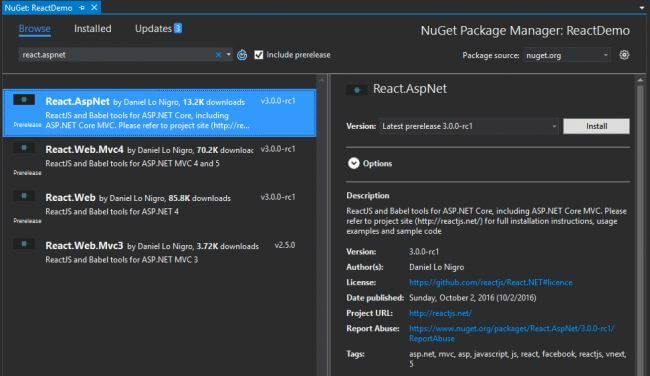 Right-click on the "ReactDemo" project in the Solution Explorer and select "Manage NuGet Packages". Click the "Browse" tab, search for "React.AspNet", and install the React.AspNet package. Since this tutorial focuses mainly on ReactJS.NET itself, we will not cover creation of an MVC controller in much detail. To learn more about ASP.NET MVC, refer to its official website. Note: In a real ASP.NET MVC site, you'd use a layout. However, to keep this tutorial simple, we will keep all HTML in the one view file. At this point, run your application by clicking the "Play" button in Visual Studio. If successful, your default browser should start and you should see "Hello, world! I am a CommentBox." If you see this, congratulations! You've just built your first React component. You can leave the application running while you continue this tutorial. Simply change the JSX file and refresh to see your changes. Notice how we're mixing HTML tags and components we've built. HTML tags are React components just like the ones you define, but they have one difference. The JSX compiler will automatically rewrite HTML tags to React.createElement(tagName) expressions and leave everything else alone. This is to prevent the pollution of the global namespace. Note that we have passed some data from the parent CommentList component to the child Comment components. For example, we passed Daniel Lo Nigro (via the author attribute) and Hello ReactJS.NET World (via an XML-like child node) to the first Comment. As noted above, the Comment component will access these 'properties' through this.props.author, and this.props.children. All we're doing here is calling the remarkable library. We need to convert this.props.children from React's wrapped text to a raw string that remarkable will understand so we explicitly call toString(). This is a special API that intentionally makes it difficult to insert raw HTML, but for remarkable we'll take advantage of this backdoor. Remember: by using this feature you're relying on remarkable to be secure. In this case, remarkable automatically strips HTML markup and insecure links from the output. In a real application, you'd use the repository pattern here, and retrieve the comments from a database. For simplicity, we'll just modify our controller to have a hard-coded list of comments. 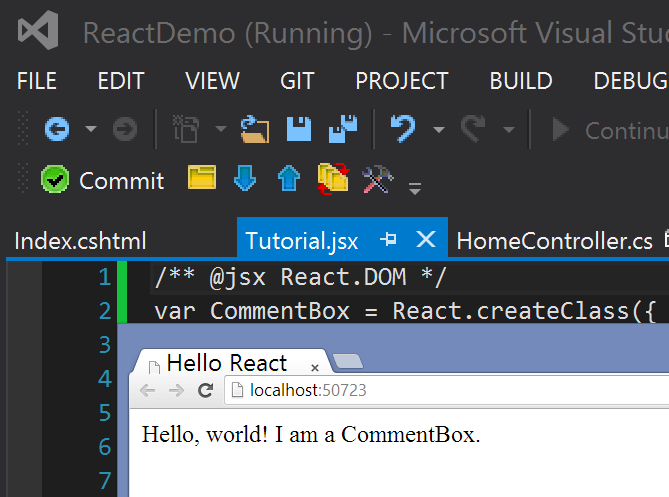 Text = "Hello ReactJS.NET World!" Text = "This is *another* comment"
The Route attribute specifies that this action should be used when /comments is loaded. This method of defining URL routes is known as "attribute routing". The ResponseCache attribute is used here to prevent browsers from caching the response. When designing a real world API, caching of API requests should be considered more carefully. For this tutorial it is easiest to simply disable caching. Note that in a real app, you should generate the URL server-side (via Url.Action call) and pass it down, or use RouteJs rather than hard-coding it. This tutorial hard-codes it for simplicity. So far, based on its props, each component has rendered itself once. props are immutable: they are passed from the parent and are "owned" by the parent. To implement interactions, we introduce mutable state to the component. this.state is private to the component and can be changed by calling this.setState() and passing an object that represents changes in state. When the state updates, the component re-renders itself. The constructor() executes exactly once during the lifecycle of the component and sets up the initial state of the component. Remember to call the super class (the class we're extending, React.Component) via super(props) before using the this keyword. When the component is first created, we want to GET some JSON from the server and update the state to reflect the latest data. We'll use the standard XMLHttpRequest API to retrieve the data. If you need support for old browsers (mainly old Internet Explorer), you can use an AJAX library or a multipurpose library such as jQuery. componentWillMount() executes immediately and only once before the rendering occurs. In the following example, componentWillMount() loads the data from our XMLHttpRequest and assigns it to the data variable. Finally, it sets the data variable in state, using setState(). Below, we're using componentDidMount(), a method called automatically by React after a component is rendered for the first time. By moving the XMLHttpRequest call from componentWillMount(), which is executed only once before rendering, to a function called loadCommentsFromServer(), we can then call it multiple times from componentDidMount() at a set interval to check for any updates to the comments. The key to these dynamic updates is the call to this.setState(). We replace the old array of comments with the new one from the server and the UI automatically updates itself. Because of this reactivity, it is only a minor change to add live updates. We will use simple polling here but you could easily use SignalR or other technologies. All we have done here is move the AJAX call to a separate method and call it when the component is first loaded and every 2 seconds after that. Hence, we will be using this.state to save the user's input as it is entered. We define an initial state with two properties author and text and set them to be empty strings. In our <input> elements, we set the value prop to reflect the state of the component and attach onChange handlers to them. These <input> elements with a value set are called controlled components. Read more about controlled components on the Forms article. You'll notice that we are explicitly binding our event handlers to this in the constructor. While older techniques, like React.createClass(...), featured automatic binding, we are using ES6 classes to define our components. React components declared as ES6 classes don't automatically bind this to the instance, so we have to explicitly use .bind(this). For components with many event handlers, this explicit binding approach can get tedious. It's also easy to forget to declare your bindings which can cause some baffling bugs. React does offer two other techniques for ensuring your event handlers are bound properly to your component. Check out the Handling Events documentation on the React website for more information. We attach an onSubmit handler to the form that clears the form fields when the form is submitted with valid input. We call preventDefault() on the event to prevent the browser's default action of submitting the form. We hope you have enjoyed learning about React and how ReactJS.NET allows you to easily use it from an ASP.NET MVC web application. Learn more about React from the project homepage and how to think about React components, or dive into the API reference and start hacking! Continue on for more awesomeness! // use a more robust system for ID generation. Server-side rendering means that your application initially renders the components on the server-side, rather than fetching data from the server and rendering using the client. Server-side rendering enhances the performance of your application since the user will see the initial state immediately. We need to make some modifications to CommentBox to support server-side rendering. Firstly, we need to accept an initialData prop, which will be used to set the initial state of the component, rather than doing an AJAX request. We also need to remove the loadCommentsFromServer call from componentDidMount, since it is no longer required. Also, we need to remove the ReactDOM.render call from the JSX file, as server-side rendering automatically outputs the correct ReactDOM.render call for you. In the view, we will accept the list of comments as the model, and use Html.React to render the component. This will replace the ReactDOM.render call that currently exists in Tutorial.jsx. All the props from the current ReactDOM.render call should be moved here, and the ReactDOM.render call should be deleted. Note that we need a copy of Remarkable in order to load it for server-side rendering. In a production app you'd probably use Bower or npm for this, but for our tutorial you can just download the file from CDNJS and save it into ~/js.